A delivery worker bundled and bagged papers at a distribution center in Worcester on Sunday. Lea esta columna en español. When a group of Globe employees arrived in Newton distribution center last weekend to help deliver papers, other media naturally were there to talk to us. Reporters delivering their own work — that’s a story. But off camera, and working side by side with us as we assembled the Sunday paper, were the people who are there every night, making not much more than minimum wage. It’s another story, seldom told. The Globe and other newspapers are delivered by a workforce largely made up of immigrants — the same people, broadly speaking, who mow lawns in the suburbs, do the dishes in restaurants, and clean offices after work hours. As the Globe works to right its delivery problems, it’s ever more dependent on finding dependable workers. They are often immigrants from Guatemala, Brazil, or Haiti, who regularly work two (or even three) jobs and start their work day at 2 a.m. sorting and stuffing hundreds of newspapers at an impressive rate. Part of the subtext of the crisis the Globe has faced for the past week is that our new delivery vendor can’t seem to find enough people willing and able to do the grueling work. As has been reported, some of the drivers didn’t stick with the new company, ACI Media Group, because of its poor routing logistics. 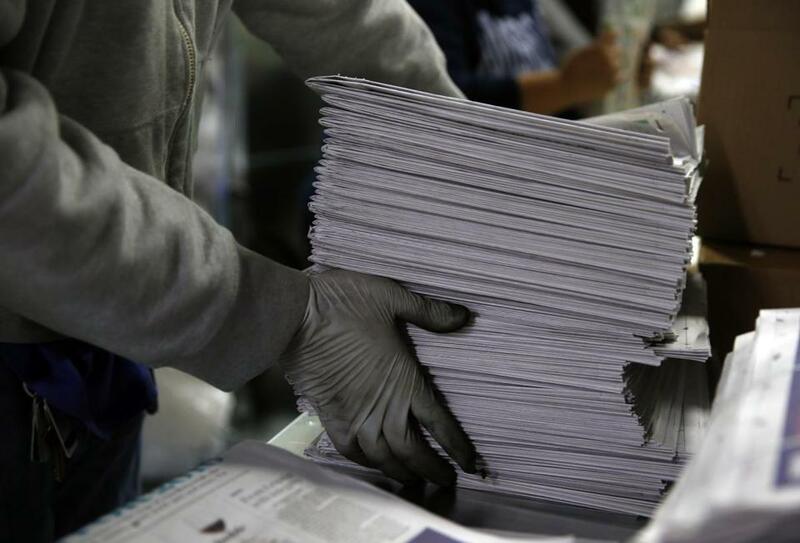 The sequence and instructions of most routes were scrambled, which meant carriers were spending twice the amount of time to deliver the same number of newspapers. More work for the same pay. So some just didn’t show up again. It was 9 degrees outside, and Roberto was readying his second load of the morning. He’s a 35-year-old father of three from Guatemala. A Waltham resident, he’s been delivering the Globe in Needham for two years. On Tuesday, the Globe rehired PCF to split the distribution with ACI. PCF will begin delivering the paper again on Monday. As the Globe distribution normalizes, consumers will start to get their newspapers again and the labor force will stabilize. We’ll all continue to reap the fruits of Roberto and the rest of the drivers’ cheap labor. As independent contractors, they won’t get medical insurance or other benefits, but will toss the paper onto doorsteps and then move on to a second or third job. I asked Roberto how his English is and he gestured with his hand: So-so. Then I asked him if he ever reads the Globe. He looked up and stared back at me as if I was saying something crazy. And he just laughed.